Mark my words, Katherine Arden is definitely going places. 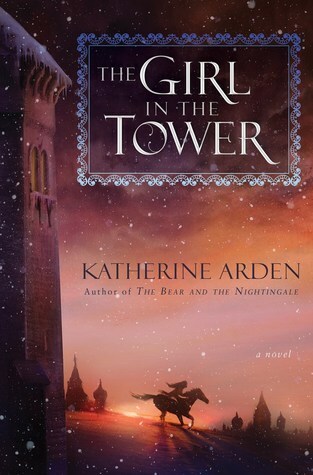 Early this year, she enchanted me with her lovely debut The Bear and the Nightingale, and now she has done it again with its follow-up The Girl in the Tower, which I thought was just as good—if not better—than its predecessor. The story continues the journey of brave Vasya, a young woman with a gift that grants her a special connection with the wilderness and the spirits that dwell within. But in the small Russian village where she lives, her abilities and strange behaviors eventually give rise to rumors that she is a witch, made worse by the town’s zealous priest who holds a grudge against her. Now she has been driven out of her community, her options reduced to either letting her older sister arrange a marriage for her, or spending the rest of her life in a convent. Neither are acceptable to Vasya, so in the end she decides to take her fate in her own hands and attempts to forge a third path. Disguising herself as a boy, Vasya takes to the road with Solovey, her trusty horse. Her adventures are cut short, however, when she encounters a group of bandits who have been preying on the nearby villages in the countryside. Unfortunately, her swift dispatching of them ends up drawing the attention of the Grand Prince of Moscow, whose party had been in the woods at the time, trying to track down the same bandits. Worse, riding with the prince is Vasya’s own brother Sasha, who had left home years ago to pledge his life to the monastery. Seeing through his sister’s disguise at once, Sasha nonetheless agrees not to reveal Vasya’s true identity as the two of them ride on to the capital with the prince, pretending to be brothers. For the moment, it seems our protagonist’s secret is safe, but with the precarious political situation in the city and the eye of the Winter King trained on her, Vasya must remain on her guard at all times. While I loved The Bear and the Nightingale, like many debuts, the first book suffered from some flaws. Some of the ones I wrote about in my review included uneven pacing, which slowed to a crawl in certain parts of the story, as well as the excessive number of POVs and minor subplots that felt haphazardly inserted into the narrative, further disrupting the flow. The good news is, I experienced almost none of these problems in The Girl in the Tower, which really speaks to Arden’s growth as an author. It seems she’s ironed out most of the issues readers had with the first book, and the result is a much smoother and more tightly-plotted sequel. When I read the first book, I also thought it a bit strange that Arden would make Sasha was such a huge part of Vasya’s life, only to send him away to become a monk, seemingly to be forgotten. As it turns out though, she actually had big plans for him in the second book, and indeed Sasha is one of the main characters in The Girl in the Tower, along with Vasya and their older sister Olga. While it’s true that they don’t always see eye to eye (especially when it comes to Vasya’s future), it still really pleased me to see more interaction between the three siblings, especially given how long we’ve watched Vasya struggle by herself. It was nice seeing her surrounded by love and support again, even if it was only for a brief period of time. And speaking of developing relationships, this book also builds upon the complicated one between Vasya and Morozko, the powerful spirit known as the Winter King or the Frost Demon. Again, the story teases a bit more about his character—still not giving us all the answers, but readers who wanted to see more of his involvement in Vasya’s journey will be very happy with the way things are going, I think. To be honest, I wasn’t sure what to make of it when I initially heard that The Bear and the Nightingale was going to be the start of a trilogy instead of a standalone. It’s always a challenge to follow up a successful debut, and I was worried Katherine Arden wouldn’t be able to come up with more to Vasya’s tale that’s worth telling. I realize now that those concerns were unwarranted, and I am glad because I found The Girl in the Tower to be as enchanting as the first book. In some ways, it even surpasses its predecessor, with a story that features more action, better pacing, and darker tones. As a reader, I just can’t ask for more than that. Now I’m very excited for the third book, which I’m sure will a finale to remember if this upward trend continues. I do like the sound of it, especially the fact that the main character disguises herself as a boy. Alanna vibes! The setting already sounded cool in the first book. A 4.5star book, nice! And even topping the previous book, always nice.For your sake I hope Arden doesn’t fall into the trap of stretching her series out and that this really will be a trilogy. Oh yes I saw this one a lot around so it’s great to see tou had a wonderful time as well. I confess that I’m starting to be really curious to try it! Wait – that’s right, the book comes out today! *lol* I knew it was coming out soon, and I’d preordered it a while ago, but I guess it still snuck up on me. Anyways, great review, Mogsy, and seeing all your praise and excitement for The Girl in the Tower makes me even more excited to read it! And apparently Book #3 is coming out in August! This series is going to be over before we know it. Wow, sometimes second books surprise you. I’m glad you found this a strong addition to the first. I’m really interested in the Russian aspects of this one as that isn’t something that I read a lot of. Thanks for a great review! I need to get to this! I didn’t love the first book, but I enjoyed it, and I’m wondering if that’ll stand an addition to the series for me. I love when second books are even better than the first! Which doesn’t happen that often. I have a copy of the first book, I’d love to read it soon. I haven’t read this other than your rating which is great! Can’t wait to pick it up. Just finished my latest book so this will now be my next read. Yes, it might be worth a try. I loved the first book, but it definitely had its flaws. I think she tried to fix a lot of them in this one though, so there’s a good chance it might work better for you! Awesome. I can’t wait to try it! Arden is clearly “going places,” as you mentioned. Why did I think this was coming out in January!??? NOW I HAVE TO READ IT. Glad to see you liked it though! Haha, I think there’s a lot of confusion because at some point, this was actually supposed to come out in January, but they bumped up the release date. For the longest time, I thought it was coming out in 2018 too!